YouTube has been releasing a recap video at the end of every year which includes bits from the top videos of the year and their creators. This year’s YouTube Rewind was another extension of the series. However – despite featuring stars like Will Smith and famous video creators – for some reason, this video has become the second-most-disliked video on the video streaming platform. YouTube Rewind was just released last Thursday, and five days from the release, it has racked up a shocking 7.7 million dislikes since its debut. Justin Bieber’s “Baby” video is still top of the list with 9.9 million thumb downs. However, the two videos cannot be compared as “Baby” has 2 billion views, and was posted all the way back in 2010 while YouTube Rewind was just posted 5 days ago! Such a shame for YouTube, isn’t it? Well, we tried to find the reasons for this backlash and it turns out no one but YouTube itself is to be blamed for it. If you dig into the comments section and the chatter about this video, one reason that stands out is YouTube omitting some of the platform’s biggest stars. YouTube dumped the likes of Shane Dawson, Logan Paul, and PewDiePie and of course, the clips from that boxing match between KSI and Paul that attracted more than a million views live, were also not part of the video. There are other reasons for this as well. “Ignoring the moments that YouTube’s community cares about and pays attention to, like a boxing match that brought in nearly 1 million live viewers, hides an enormous part of the platform’s cultural shift,” she writes. Well, since YouTube is one of Google’s entities which it acquired to make money, so let the money talk! 0.9 million thumbs down ? You made a mistake. I think you meant 9 million thumbs down on the justin bieber video. 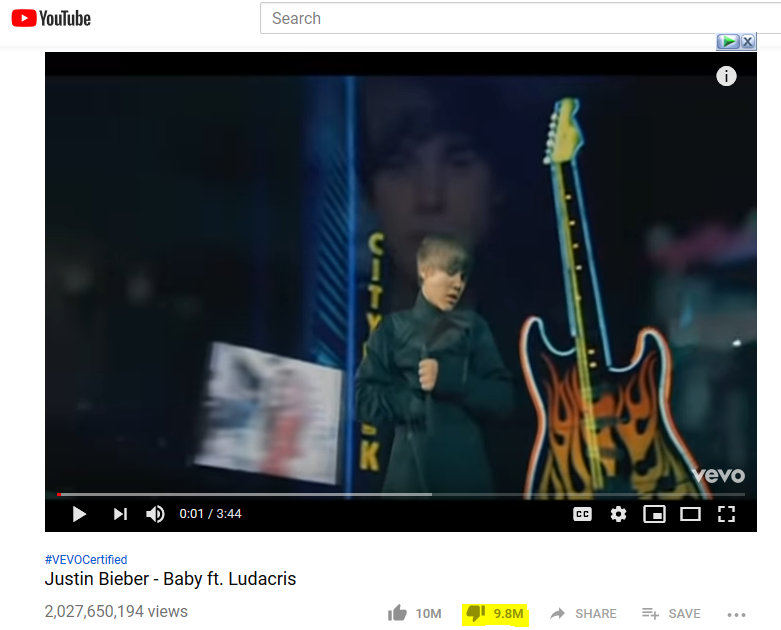 YT rewind 2018 will beat the record of ‘Baby’ song of Beeber. Such a shame for ProPakistani, isn’t it?